Dynamite’s latest array of new offerings comes hot on the heels of its last big boilie introductions. Carp deity Terry Hearn’s all-season Complex T Boilies now come with matching feed pellets and paste, while that perennial favourite, Monster Tiger Nut, also gets its own uniquely flavoured retinue of matching pellets. 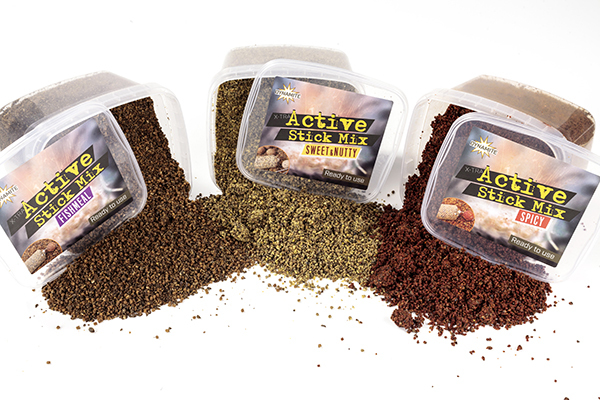 Add to these additions to the Frenzied Feeder Pulses & Particles range, cooked in the jar to retain all their natural goodness... X-tra Active Stick Mix... and Tuff Paste and lead wrap in Dynamite’s most popular flavours... and you begin to see why the company’s products are the first choice for carp anglers who take their sport seriously. 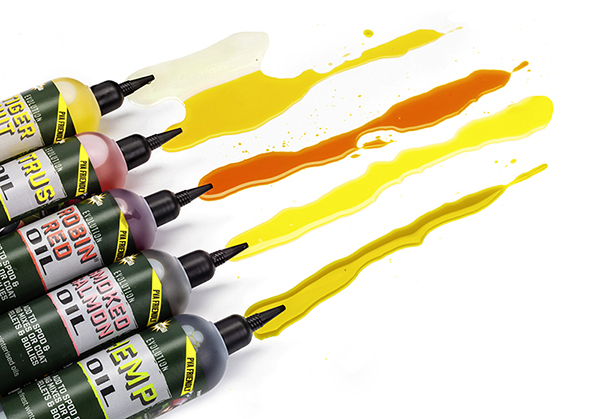 These premium grade refined oils come in Smoked Salmon, Tiger Nut, Hemp, Citrus and Robin Red flavours, and are thin enough to be injected into solid PVA bags or squirted directly on to baits and feeds. In water they emit an attractive rising flavour slick, drawing fish towards your hookbait. In 300ml bottles. Used straight from the tub, new Fishmeal, Sweet and Nutty, and Spicy flavours. Team them with PVA mesh sticks and solid bags to make the perfect base mix to which chopped boilies, pellets or particles can be added. In 650g tubs. Monster Tiger Nut boilies are quite superb for targeting really big French carp. Their sweet, nutty aroma has a proven track record. The only things missing from the Tiger Nut range were matching pellet feeds, and now Dynamite has plugged the gap with these 4mm, 6mm and 8mm pellets in 900g bags. These Dynamite Baits premium particles are cooked inside the jar to retain all their natural oils, attractants and goodness. No preservatives are added to these natural baits in 2.5-litre jars.Krill, Naked and Sweet & Milky are the latest versions to hit the shelves. New Tuff Pastes have a strong texture for wrapping around boilies and leads. In Complex T, The Source, Crave, Monster Tiger Nut and Red Amo flavours, they contain all key ingredients found in the matching boilies. The paste breaks down to leave a cloud of enticing attractants and flavours around your hookbait.